A brand new standard inlet manifold complete with the later style wiper fitting boss. The boss is undrilled, so you would have to drill and tap the manifold if you wanted to use the A-17540 wiper connector. Note, this is the only standard inlet manifold available. If your car is right hand drive, you may have to fabricate some additional brackets for the throttle linkage. Model A Ford Vortex Dual Inlet Manifold. This style of manifold uses two original Zenith carburetors. This aluminum inlet manifold, still bolts to the pad of the exhaust manifold like the original so heat is transferred to the intake. Linkage included. 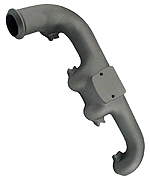 Made in U.S.A.
Downdraft Inlet manifold, in cast aluminium, fits 1928-34 4-cylinder Engines. Uses any 3 bolt style Ford flathead carb. Dual linkage positions and a vacuum port on the bottom. Convert your Model A to a downdraft carb, instead of an updraft one. This alluminium arrangement will allow more fuel/air to enter the engine for increased performance. Carb flange is machined to accept early V8 carbs, like the Stromberg 97. 1928-34 Thomas finned dual carb performance Inlet Manifold. Machined to accept two Stromberg 97 or other early V8 carburetors. Made in U.S.A.
1928-34 Thomas finned tripple carb performance Inlet Manifold. Machined to accept three Stromberg 97 or other early V8 carburetors. Made in U.S.A. The two bolts and lock washers needed to bolt the intake to the exhaust manifold. Made in USA. Why put up with a leaky or warped manifold when you can install a nice new one and end your troubles! Note: If you are not using a new inlet manifold, check the inlet and exhaust manifold surface with a straight edge. If not perfectly flat, you will have a leak. A machine shop can mill the surface straight. This is the same manifold as the A-9430, but a gray cast iron finish is baked in an oven to withstand up to 1800 degrees. This baked finish prevents the manifold from rusting. This protective gray finish looks like the original cast iron. 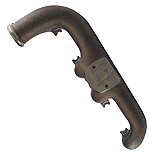 Improve performance with this cast iron header. This header performs the same as a tube type header but is quieter than tube type headers. Comes with adapter from 3" to 2" for stock Model A exhaust. Note: You will need to use a downdraft intake manifold with this header and cannot be used with our A-6705-F oil filter kit. Made in U.S.A.
A set of 4 brass nuts used to hold the manifold on. Made in USA. These are the heavy cup shaped washers that hold the intake & exhaust manifolds in place. The crown or high point of the washer goes away from the motor. Made in USA. Manifold Studs for the 1928-34 engine. 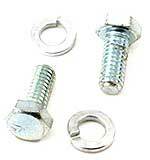 Set of 4 studs that screw into the block for holding the manifold on. Made in USA. 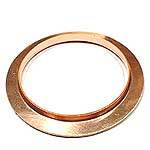 Copper Manifold Gaskets 1929-31. Made in USA. Manifold Gasket Set 1928-34. Flat asbestos type 2 piece set for the 4 cylinder engine. Made in USA. 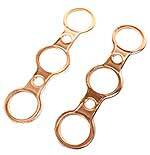 Copper Manifold Gasket set. This is the authentic type as originally fitted to the Late 1931 cars, but will fit all models. Made in USA. 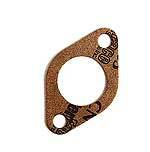 1 piece Manifold Gasket for the 1928-34 4 cylinder engine. Asbestos substitute with metal shield on one side. One-piece style. Metal side to the manifolds. These are the 4 rings that fit into the manifold & block recesses for aligning the exhaust ports and to prevent leaks. Note: If the manifold or block has been resurfaced, the width of the gland rings may need to be reduced by the same amount. Comes as set of 4 Rings. These are the original gland and copper ring type manifold gaskets for the 1909 - 1927 Model T Ford engine. 12 piece set. Note: These are not included in most engine gasket sets. 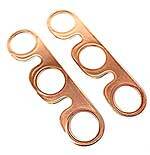 Copper manifold gasket set for the 1909 - 1927 Model T Ford engine. Steel backed manifold gasket set for the 1909 - 1927 Model T Ford engine. Paper style manifold gasket set for the 1909 - 1927 Model T Ford engine. Block-Off Plug used on the engine block and also the manifold vacuum take off. 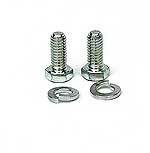 Use this 1/8" pipe thread plug to plug off a vacuum wiper hole in the intake manifold if it is no longer needed. This slotted pipe plug also goes on the side of the block near the bottom where the oil pump slips up in. You open this to see if your pump is pumping. Quite often you will find a bolt in the block where this plug is supposed to be. The brass connector that screws into the intake manifold to connect the vacuum line to.